A viewing shelter was required for the Asian rhino enclosure. It needed to be suspended 3m above the rhinos on a steel gantry and have a natural, Asian theme. It was critical that the structure was safe and secure, suspended high over the rhinos. A steel mesh walkway needed to be disguised, creating a cohesive theme with the viewing shelter. Working closely with ZSL Whipsnade and London Zoo Interpretation and Design staff, a bespoke solution was developed. 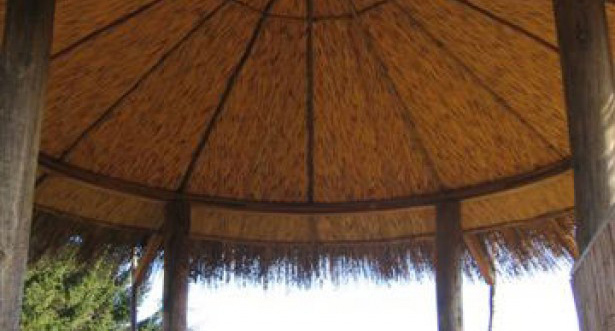 A 3m diameter, circular, timber viewing shelter was created using six eucalyptus posts, which supported a timber, conical roof. The roof was clad in natural Cape Reed and the underside was lined with Cape Reed board. 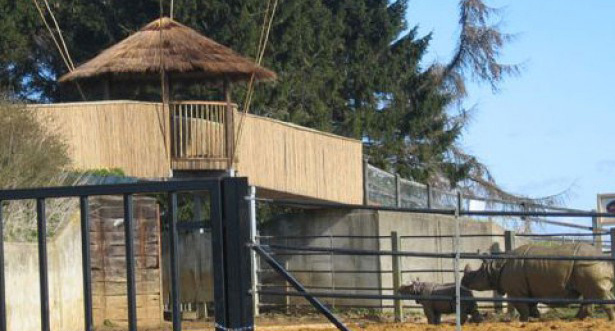 With two entrances and overhanging semi-circular bays each side, the shelter allows unrestricted access over the bridge and viewing of the Asian rhinos. Curved handrail sections with eucalyptus spindles provide a safe and tactile barrier for the younger visitors to view the rhinos below. The steel mesh fencing was clad in natural cane, topped with half-round eucalyptus posts disguising the steel walkway. The whole project was installed in just two days, on time and on budget.